I’ve been on a book hiatus for a few weeks and my friend Jen gave me just the boost I needed to get back on the wagon! She checked out a book from the library for me! What a true friend 🙂 I could gush about how thoughtful she is…so I will! She is really thoughtful! In fact, Jonathan and Jennifer both deserve a little horn tootin. Not only are we great friends and fellow community group members, we are also neighbors! And it should be noted that Frank (their beagle) is one of the only dogs in the world that Krusty will not only tolerate, but plays with! Last night they came over to consult with me about the type of curtains to buy to go with the new rug since we’ll be moving the red ones to the dining room. But of course they didn’t just come over. They showed up with spaghetti, brownies and a whole bag of Larry’s Beans coffee! And she told me all about this book which I can’t wait to read! Um, above and beyond folks! Seriously 🙂 So needless to say, we love them. And not just cuz they give us stuff heehee. 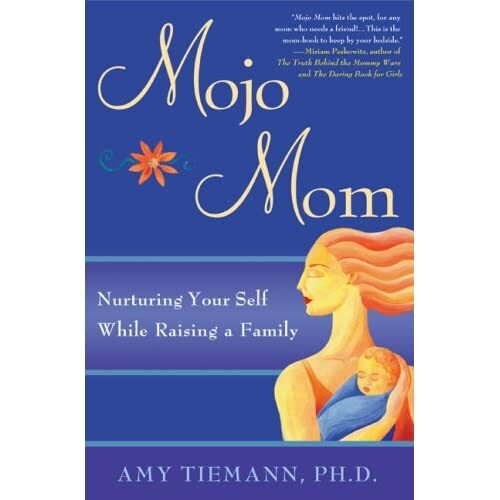 The book is called Mojo Mom and I think it’s just what the Dr. ordered! After yesterday’s post she decided it was high time I had a mojo boost and I agree! I’ll post a review when I am done, but for anyone interested, you can get it at Amazon. We also love Jonathan and Jenny too… but only for because of the free stuff. awww… thanks! our friends are so important and dear to us… well, maybe not joe & jessica after that bratty comment.